Familia Tribute To Bebo and Chico is an awe-inspiring collaborative album between Arturo O’Farrill and Chucho Valdez. Spanning three generations of musicians, the project is a tribute to the musical legacy of their fathers: Dionisio Ramón Emilion “Bebo” Valdés Amaro and Arturo “Chico” O’Farrill. The first half presents a blending of Afro-Cuban music genres, jazz idioms, and Haitian meringue, and overall is reminiscent of Latin jazz compositions of the 1950s-90s. The large ensemble instrumentation is a reminder of the Cuban dance bands and the jazz big band traditions, setting brass against saxes on a bed of Afro-Cuban rhythms. The second half of the album introduces the voices of the third generation (ensemble) with compositions influenced by current trends in jazz—odd meter, hip hop, funk, etc.—mixed with Afro-Cuban genres—danzón, songo, and other rhythmic patterns. The album opens in a celebratory fashion with the tune “BeboChicoChuchoTuro,” which is a joyous Haitian meringue, beginning with an extremely rhythmic piano cadenza that sets up the carnivalesque feeling in the ensemble. The lush harmonies in the horn section create a festive feeling while the rhythm section invites listeners to dance and stomp their feet. On “Fathers, Mothers, Sons, Daughters” we encounter the meeting of the second generation, Chucho and Arturo, with the melodious and virtuosic playing of the third generation: pianist Leyanis Valdés, drummer Jessie Valdés (later on “Recuerdo”), trumpeter Adam O’Farrill, and drummer Zack O’Farrill. The improvised solos, between each soloist, display the versatility and musicality of both families. The later “Recuerdo” adds a warm almost nostalgic sensation, with its medium tempo and surprising rhythmic superimpositions, creating an intimate space for listeners. On “Pura Emoción,” and “Para Chico,” Chucho Valdés and Arturo O’Farrill perform two heartfelt solo piano pieces filled with emotion as they pay homage to their fathers. The final song “Raja Ram” presents an unexpected twist with the addition of musician Anoushka Shankar, who plays an electrified sitar solo that doesn’t disappoint the listener. 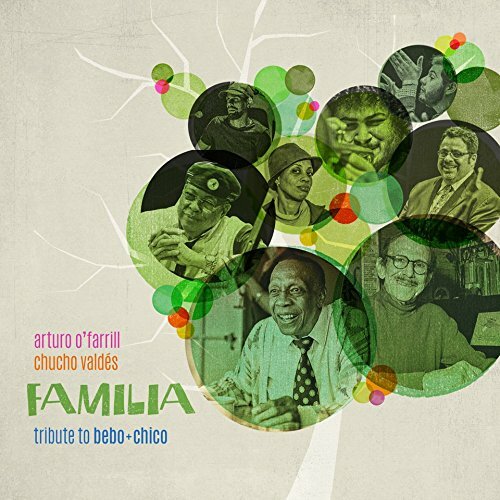 Familia Tribute To Bebo and Chico serves as a historical marker of the legacy between the Valdés and O’Farrill families, paying tribute to both old and new influences in Afro-Cuban music and jazz. 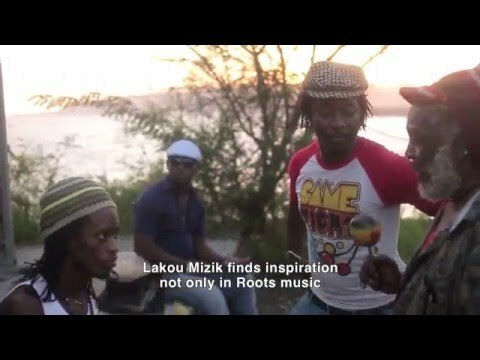 Guitarist and singer Steeve Valcourt, singer Jonas Attis, and American producer Zach Niles (who worked on the documentary film that introduced Sierra Leone’s Refugee All Stars) began the group Lakou Mizik in Port-au-Prince in 2010, believing that music could help people recover and find positivity despite the horrible tragedy of the Haitian earthquakes. The group has grown from three to nine members who range in age from their early twenties to late sixties. Their debut album Wa Di Yo is being released April 1 on Cumbancha. 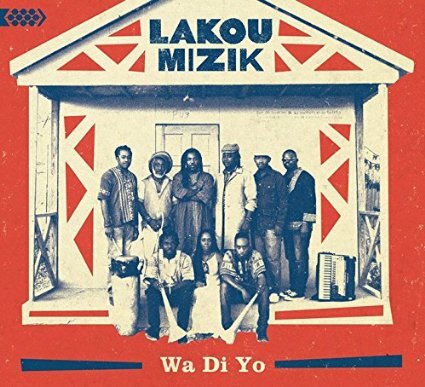 The members of Lakou Mizik each have a different story to tell, and they bring different musical styles along with their distinctive perspectives. Wa Di Yo represents the confluence of many influences within Haitian culture: African, French, Caribbean, and U.S. The collectivity that Lakou Mizik enjoys was not always a natural fit. Originally, vocalist Nadine Remy was afraid of the vodou singer Sanba Zao due to Remy’s own evangelical Christian roots. However, Remy and Zao are now close and Remy has embraced and learned from the racine (roots) music movement. Accordions also are foundational elements of the album’s sound on tracks such as “Poze,” “Anba Siklòn,” and “Is Ta Fi Bo.” There are also tracks without the band’s cadre of musical instruments, occasionally the band delivers such raw tracks such as “Bade Zile” and “Parenn Legba,” both traditional songs arranged by the group as beautiful full-chorus a capella songs with only slight percussion accompanying them. In Creole, the word lakou has multiple meanings which range from a communal gathering place to home or “where you are from.” Rising from terrible national tragedy, Lakou Mizik takes pride in the many musical styles and cultural backgrounds of their members and, more broadly, of their country. One member asserts in a promotional video for the album, “the true richness of our culture has yet to be discovered.” Wa Di Yo may begin the discovery process for listeners around the world. The Alan Lomax Estate and Harte Recordings are dedicated to supporting earthquake relief efforts in Haiti. To that end, The Alan Lomax in Haiti box set has been reduced for a limited time to $115, with $15 going directly to local disaster relief organizations in Haiti (for orders placed here). Alan Lomax’s field recordings from Haiti, collected for the Library of Congress over a span of four months in 1936-1937, are available to the public for the first time in more than seventy years. Comprising 10 discs of audio and video material, and a nearly 170-page book that redefines the idea of mere liner notes, the collection offers a comprehensive sampling from Lomax’s trip to Haiti, undertaken when he was just 21-years old and representing one of his earliest independently motivated projects after establishing his interests in folk music alongside his father. More importantly, after a lengthy preservation and restoration process, copies of all of Lomax’s recorded materials (over 1,500 audio recordings, and several reels of black-and-white and color film footage) can now be returned to the Haitian Ministry of Culture and other national agencies as part of the mission of the Association for Cultural Equity and the Alan Lomax Archive. Lomax had a particular interest in exploring and documenting the ways in which African cultural retentions were manifested in Haiti, after he had already been convinced of such a dynamic through his collection of music in the American South among African Americans. Not alone in his interest, Lomax was one of numerous American scholars and authors who had turned attention to Haiti during this time, including Melville Herskovits and Zora Neale Hurston, both of whom were helpful to the young Lomax in his research. He discovered, and effectively captured through his recordings, a culture that exemplified not only a core of strong retentions and adaptations of African traditions, but also distinct influences from France, Cuba, Trinidad, and the United States. 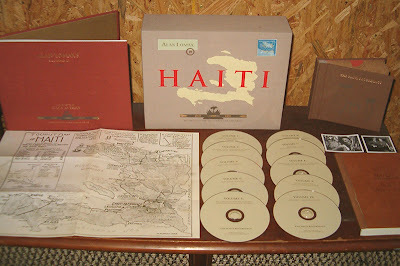 The book accompanying the “Haiti Recordings” reveals a tremendous wealth of information in its combination of original notes from Alan Lomax and the subsequent commentary from Professor Gage Averill, an ethnomusicologist who specializes in Haitian and North American music and who provides the liner notes. Furthermore, these “notes” are the result of collaboration between archivists, curators, audio engineers, historians, and linguists over a period of nearly ten years, in an effort to successfully preserve, translate, and publicly present this abundance of material. Still, it is Alan Lomax, himself, who maintains a vivid and constant presence throughout the text, as one reads long, candid excerpts from his field journals and finds reproductions of photographs, sketches, receipts, and correspondence from his trip to Haiti. These recordings have been divided into ten distinct volumes, documenting sub-categories such as urban popular music, childrens’ songs, work songs, and ceremonial music. For each volume, there are two sections of text to accompany the recordings. The first is a somewhat broad introduction to each given genre or special recording environment, and normally includes liberal amounts of Lomax’s own insight as well as more academic contextualization from Averill. The second section in each volume is a more detailed, track-by-track analysis of every song, with lyrics provided in the native Haitian Kreyol as well as English translations. Lomax’s diligent documentation at the time of the original recordings allows inclusion of details ranging from names of performers and instrumentation to the patterns of wallpaper and arrangement of food on tables in the room. Taken as a whole, the liner notes offer a fascinating recreation of Alan Lomax’s own immersion into Haitian music and culture, and also stand alone as a valuable research document (with a relevant bibliography) for those who study Haiti today. As one would expect from an expansive sampling of folk music performances, Lomax captures music devoted to the full spectrum of lived experience – love, death, gender roles, political endorsements, cautionary tales, popular fashions, social etiquette, scandalous gossip, lullabies, medical prescriptions, religious beliefs, etc. Using the most advanced portable recording technologies of his era, Lomax cut aluminum discs featuring everything from multiple large ensembles in the midst of Carnaval demonstrations to intimate solo singers. Due to the limitations of his equipment and the unpredictability of his surroundings, Lomax was admittedly disappointed with some of his results and, indeed, certain lyrics have proven difficult to understand or translate. Still, for those with realistic expectations of early, historic field recording efforts, the audio quality is remarkable and is a testament to the seriousness of both Lomax and his 21st century counterparts who have likewise taken advantage of the latest technologies in order to digitally restore these recordings. The intelligent, comprehensive packaging of Alan Lomax’s recordings of Haitian music for the Library of Congress makes this collection an incredible resource for many fields of study and an exemplary model for coping with field collections of this scale. Certainly, students of Haitian music and culture benefit from the raw source materials, including a number of first-known recordings from Vodou ceremonial atmospheres and archetypal examples of musical forms that have since been transformed or re-imagined. The multi-cultural synthesis of West African, French, and other worldly influences make for a fertile example of how music proves to be a flexible and accommodating vehicle for human expression. Ethnomusicologists further benefit from such extensive inclusion of Lomax’s personal notes, discussing not only the details of his informants and collections, but also rich observations of his surroundings and evidence of his struggles and frustrations in the field. Archivists and curators are presented with the successful preservation and presentation of a massive quantity of material, fraught with technical concerns and much room for only speculative interpretation and translation given the great length of time that has passed since its original collection. Alan Lomax recognized the richness of Haitian culture in the late 1930’s, a time of peculiarly complex transition. The population was already infused with a mixture of distinctly West African and French characteristics, and just following a lengthy U.S. occupation and striving to embrace a renewed national identity, they provided Lomax with an astounding and varied document of celebration, protest, faith, and humor as performed through music. As Averill notes, “the power and vitality of this ongoing cultural revolution is on full display in this collection.” Today, in the moment of another peculiarly complex and historically significant reaction, when Haiti has come to the attention of the world for its needs and vulnerabilities, this collection is a timely and encouraging reminder of Haiti’s valuable cultural resources and strengths.